Studies show that approximately 187,000 people die each year from drug overdose. A majority of these deaths are attributed to opioids, one of the most powerful drugs available both legally and illegally. According to the National Institute on Drug Abuse, over 90 Americans die each day from opioids overdose, a tragic and alarming statistic. While many have images of underground drug peddlers, cartels, and violent gangs, a large part of opioid abuse is actually from prescription drugs. The National Institutes of Health (NIH) notes that almost one-third of patients that are prescribed opioids for chronic pain misuse them. Around 80 percent of heroin users first abused prescription opioids. The unfortunate reality is that the roots of the opioid crisis run deep. Arguably, it is a greater challenge to combat the “legal” side of the crisis–prescriptions, pharmaceutical companies, and the like–than the illegal side. This is because, despite stricter Center for Disease Control (CDC) guidelines, rules and regulations are extremely difficult to enforce. What’s more, it is increasingly hard to monitor over-prescriptions, prescription fraud, and documentation abuses. 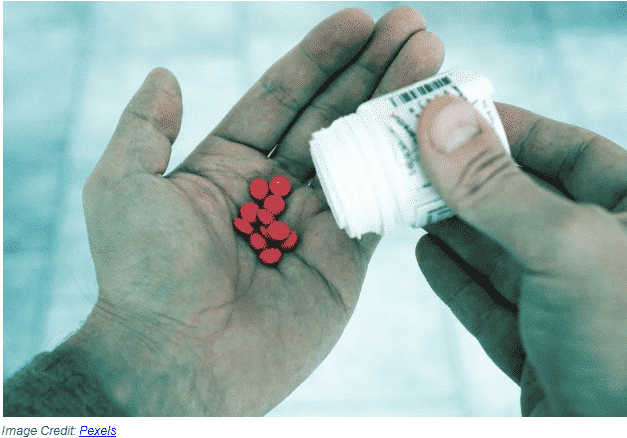 Pharmacies are compelled to trust doctors’ judgments, and physicians are sometimes unaware that patients have been prescribed drugs by other physicians for the same medical problem. Despite repeated attempts to solve these problems, no viable answer has been found. However, thanks to the promising prospects of blockchain technology, all of these issues may be solvable. 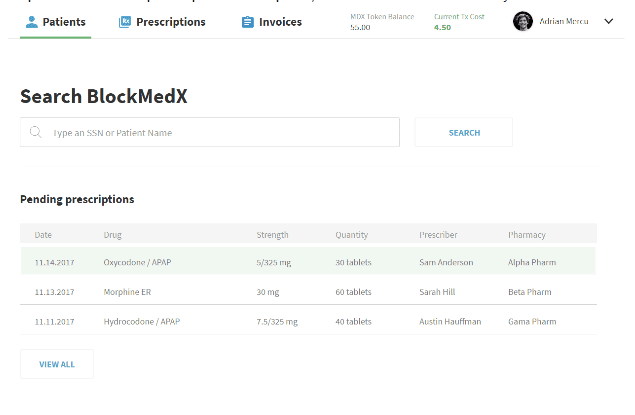 One company, BlockMedx, is working on an HIPAA compliant system that provides a completely secure, end-to-end solution that will go to great lengths in solving the opioid and prescription drug epidemic. 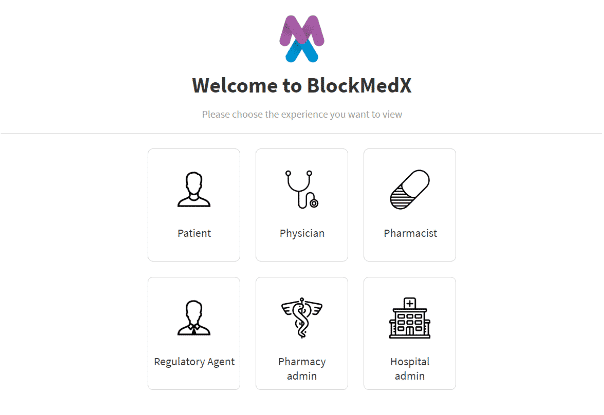 BlockMedx’s solution revolves around creating a streamlined, secure system for drug providers, pharmacists, and patients. It runs on the Ethereum blockchain, creating a cryptographically secure prescriber-to-patient platform. Prescriptions are securely transmitted and recorded by the blockchain, in conjunction with platform’s token (MDX). Each token is paired with a unique and specific prescription, thus validating the origin of the prescription. In order to access the prescription, physicians, pharmacies, and patients will have to login to a website that is connected to the blockchain. Each physician will have access to their personal prescribing history as well as the history of each patient they interact with. This will help them detect prescription abuse, which often takes place when a patient sees multiple doctors to receive medication for one issue. Physicians will also be able to make use of BlockMedx proprietary verification system, which ensures that only the actual physician can digitally sign prescriptions. Once a physician issues a prescription it is sent in the pending state, where it awaits a signature by BlockMedx. When the prescription is digitally signed on the blockchain, it is moved to the approved state. It is then logged on the blockchain as an immutable record. Physicians can therefore know for certain that their patients have been issued the correct prescription. They can also track its progress, allowing them to make sure that their prescriptions aren’t defrauded or misused. Pharmacies are given a list approved prescriptions that can be accepted, declined, or revoked. They will then open the BlockMedX decentralized app to access the network. The pharmacy can view the prescription information as well as the patient’s full prescription history. They will then accept or decline each prescription on the queue, based on the information they have. If a prescription is accepted, the pharmacy will receive the MDX tokens sent by the physician and deposited into its wallet. Then, pharmacies can receive payment from the valid patient via MDX tokens. From a regulatory perspective, the blockchain provides unique advantages that the current pharmaceutical system doesn’t have. Because all transactions, from physician to pharmacy to patient, are logged on the public ledger, any third party entity can audit the transactions. For governments and regulatory bodies, this means there is an easy and secure way to enforce existing regulations and requirements. By viewing the immutable record stored on the blockchain, authorities can track prescription abuses and prosecute them accordingly. From the perspective of physicians and pharmacies, the blockchain provides a way to view prescription histories in order to help prevent fraud and over-prescribing. The BlockMedx platform allows all parties involved, including third party auditors, to crack down on the opioid crisis in an efficient and streamlined manner.